There are, quite literally, hundreds of motherboards to choose from when specifying a system. Yet a bit of common sense can whittle down the prospective candidates to a handful. 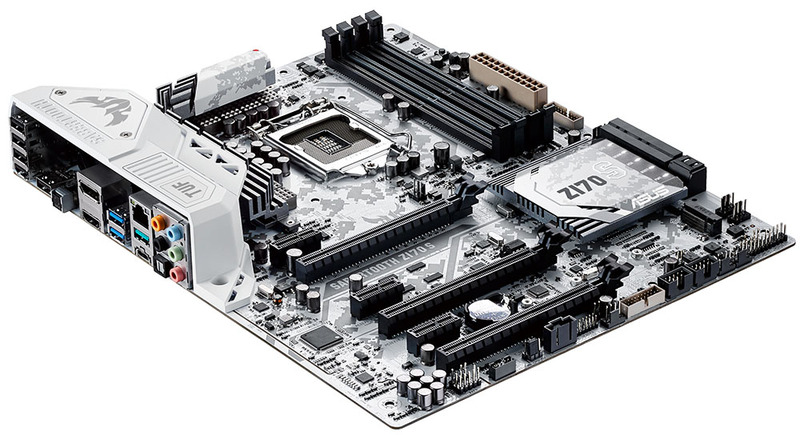 Most do-it-yourself builders will go for the performance Z170 chipset that supports the Skylake range of Intel processors. A sensible consideration of features and budget will make the list shorter. 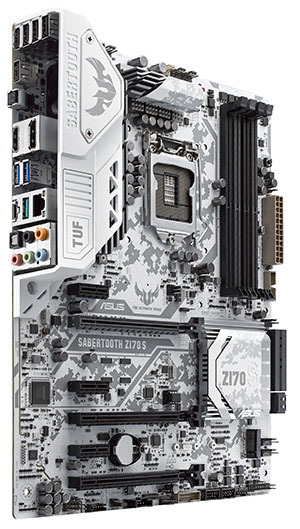 And for those with a desire to stand out for the crowd with a board that has ruggedness at its heart, the Asus Sabertooth line has been the go-to solution. The latest iteration is the 'camo-inspired' Z170S, priced at £160, so let's take a look. The Digital Camo livery is an acquired taste, but the board looks better in the flesh. One would assume that Asus and Crucial have worked to together to some degree as the latter's Ballistix Sport LT is an almost-perfect aesthetic match. And if it's matching that's important, the Echelon GTX 950 is a purposely fine match. 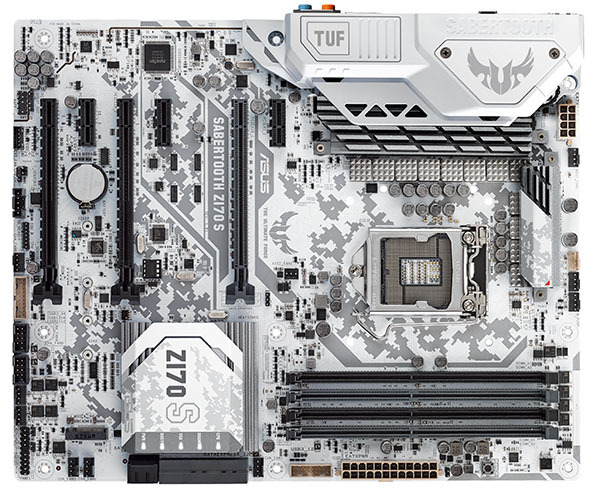 Rather than bore you with a list of features that are present on each and every Z170, emanating from the chipset, let's examine what's different enough for Asus to charge a £60 premium over a number of quality boards. A collection of enhanced cooling and power regulation is grouped under The Ultimate Force (TUF) banner. These include TUF alloy chokes, capacitors, Mosfets, electro-static discharge guard across four connectors, and beefier heatsinks. While documentation states that feature 'X' is 13.6 per cent better than normal and feature 'Y' last 5x as long as standard capacitors, we have yet to have any recent motherboard die on us. 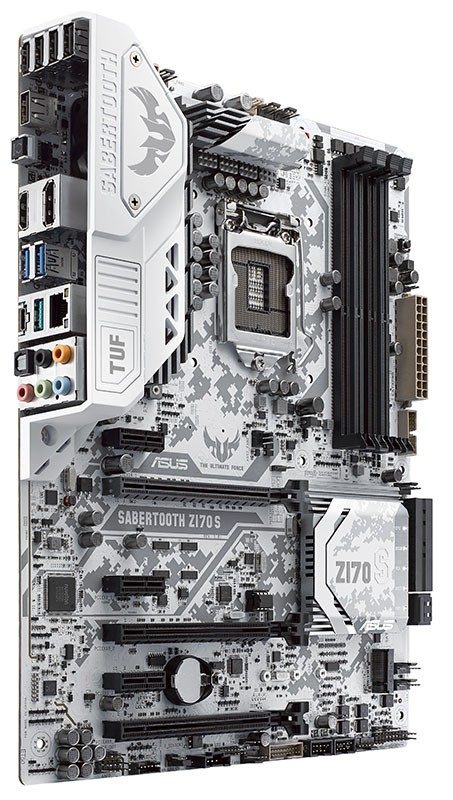 Yet we believe the extra attention to the 24/7 nature of the board is telling in a different way: Asus says 'in our development labs we heat them, chill them, bend them, shock them and drop them — so you know that your TUF motherboard is certified for 24/7 durability!' and backs it up with a five-year warranty that is uncommonly good. 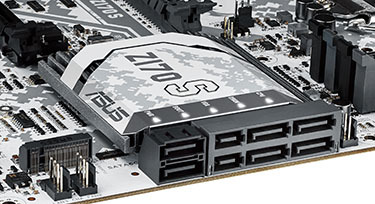 Comparing the quality and integration of cooling to a normal Asus motherboard - the Z170 Gamer in our instance - shows this is a better-built board. What's also different from the norm is the optional cooling on the left-hand side, just above a large heatsink, where you can add an additional 40mm fan for extra airflow. Considering the Z170S also possesses a 12-phase power supply, running this board at stock speeds misses the point almost entirely. The supposed TUFness also extends to monitoring hardware and additional software. Z170S features an upgraded processor called TUF ICe that, in conjunction with the Thermal Radar 2 software, offers impressive levels of control and information: we'll take a look at on the next page. It's also chock-full of fan-headers, 10 in total, which is more than any other board we've come across recently. Asus then also caters for the app-happy crowd by making this board compatible with TUF Detective 2 software for iOS and Android devices. Want to upgrade the BIOS from a smartphone without turning the motherboard on? You can. The usual Z170 goodies are present. These include a full-length M.2 slot, SATA Express, three PCIe x16 slots for quad-SLI or CrossFire running (two cards), but the board, like most, remains limited in terms of electrical allocation per slot due to the LGA1151 chipset. A nice, big gap between the primary and secondary slots is always appreciated, but we reckon it makes sense for Asus to invest in some slot-strengthening technology such as Gigabyte has done recently. 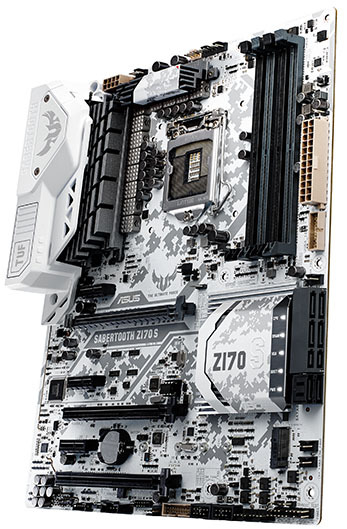 Not only would it help with massive cards, it looks good and would compliment the Z170S philosophy nicely. Another handy feature is the five LED lights on the southbridge. They denote CPU, RAM, VGA, Boot and Power status and light up ice-white if the board passes each step. We're fans of onboard power and reset buttons for tinkering; Asus leaves it out on this edition, sadly. On the back we have USB 3.1 in both Type-A and Type-C flavours from an ASMedia chipset. DisplayPort and HDMI are sensible outputs from the processor's IGP while audio is provided by the ever-present ALC1150 Codec. Note that we're showing it here with the optional fan; it ships with a large hole in this section instead, making it look rather unsightly.